Meet Bandit! He is a wee little guy, only weighing around 6 lbs and is about 4-1/2 years old. He is energetic and is a busybody - he has to make sure he isn't missing out on any of the action! He gets along well with other dogs once properly introduced and acclimated but especially likes to hang out with his human. He's not all that interested in toys but he does like soft things like blankets, beds and large stuffed animals. He can also climb like a monkey! He sleeps in a crate at night and likes having his own space although he would prefer to be right next to his human. He does fairly well on a leash and is a good companion pup. If you would like to meet Bandit, please go to www.newbestfriend.org and submit an adoption application. Our adoption fee is $250 and includes neuter, vaccinations and microchip. PLEASE NOTE: We do not adopt outside the Greater Houston area. Maya is a 3-1/2 year old Chihuahua and Dachshund mix (best guess) who weighs about 8 lbs and is full of personality. She loves to play with other dogs and wrestling is her game. She loves going outside, (especially if there is a "sibling" to run around the yard with) but also likes chilling indoors, too. She does well on a leash and is used to sleeping in a crate. She does fairly well with going potty outside although we all go on a schedule so she is not yet trained to alert. 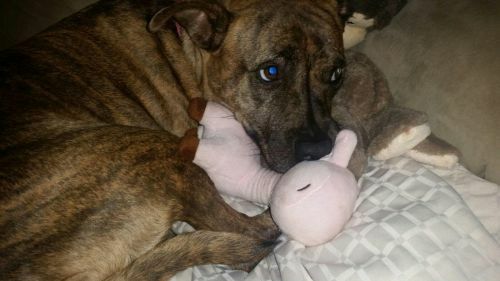 She gets along well with other dogs and seems like people in general and is a big fan of toys - the squeakier the better! If you would like to meet this little girl please go to www.newbestfriend.org and submit an adoption application. Our adoption fee is $250 and includes spay, vaccinations and microchip. PLEASE NOTE: We do not adopt outside the Greater Houston area. My Name is Benjamin and I am 3 years old. I am a very social guy, I am very well behaved, and I get along great with people, kids and other dogs. I really enjoy playing fetch, going on walks, car rides and trips to Petsmart. My foster mom says I have a great personality and that Iâm truly the whole package. Iâm kennel trained and pretty much potty trained on a schedule. I love to play with other dogs, my toys and I do also love treats. My foster mommy says I weigh around 15 lbs and that I am very smart and loyal and would be a perfect companion for anyone. I am best suited for a home with another dog to play with because I really enjoy having a furry sibling. If you would like a playful but calm new companion then I am your guy. If you would like to meet me please go to www.newbestfriend.org and submit and adoption application. My adoption fee is $250, which includes vaccinations, neuter and microchip. PLEASE NOTE : we do not adopt outside the greater Houston area. Meet Noelle! 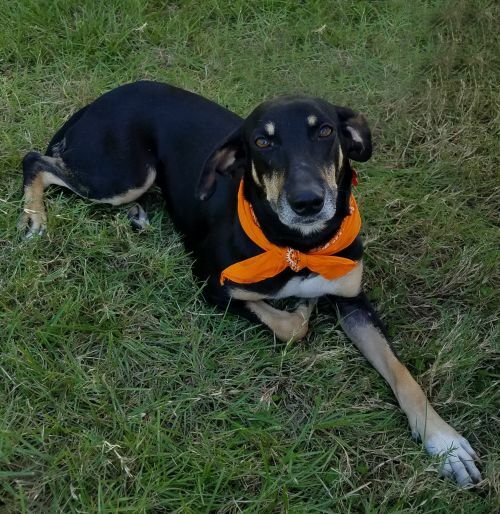 She is a 3-1/2 year old Hound mix who is a very sweet girl. She loves to play with her foster siblings and is good with other dogs, usually deferring to them if she doesn't know them. She is a bit reserved when she first meets new humans but once she warms up she is a happy goofy girl who loves wrestling and toys. 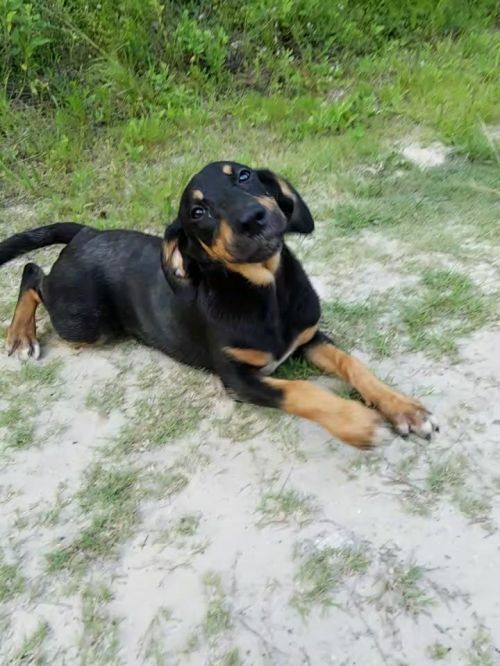 She is energetic at play but also knows how to chill - she just enjoys hanging out with you! 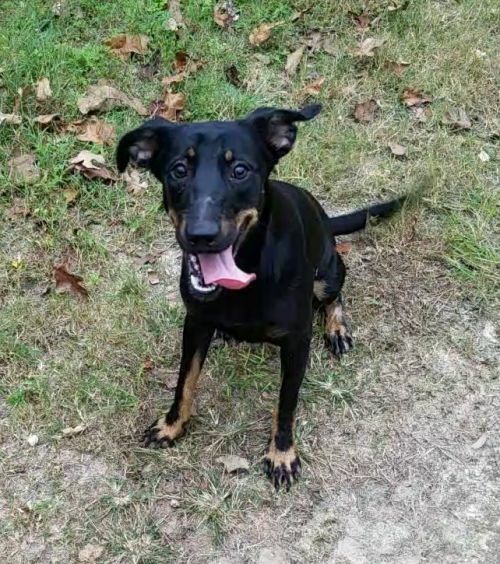 Noelle is kennel and house trained and has a great temperament for being a solo dog or a member of a pack. If you would like to meet Noelle please go to www.newbestfriend.org and submit an adoption application. Our adoption fee is $250 and includes spay, vaccinations and microchip. PLEASE NOTE: We do not adopt outside the Greater Houston area. My name is Django! I am a Shar Pei and Staffie mix (best guess). I am 3 years old and weigh around 32 lbs. I am a little timid at first but warm up very quickly because, well, I love to be petted! I get along with other dogs once properly introduced. I do well on a leash but I also like to be let off leash in a contained area to go for a good zoomie run! I do love a running buddy, too, so would do well with a sibling who likes to play. I am kennel trained and I am house trained on a schedule. Although I like to play, I also know how to chill and just love being near my humans. If you would like to meet me please go to www.newbestfriend.org and submit an adoption application. My adoption fee is $250, which includes vaccinations, neuter and microchip. PLEASE NOTE: We do not adopt outside the Greater Houston area. My name is Olive! 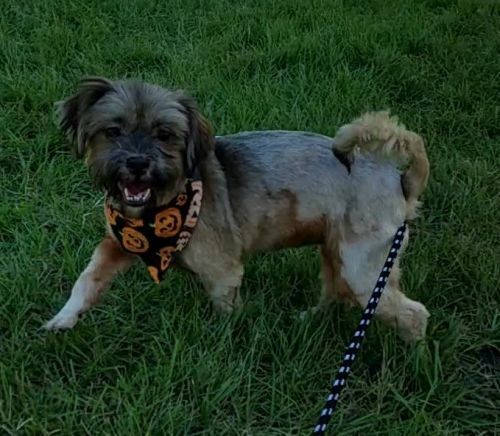 I am a Lhasa Apso and Yorkie mix (best guess) and 6 years old, weighing in at about 14 lbs. I don't think I have ever met a stranger because I am very personable and outgoing. I love to play with my foster siblings and really love T.O.Y.S.!! In fact, one of my favorite things to do is wrestle with one of my siblings while holding a toy in my mouth...of course without sharing! I am light heartworm positive and I am on the latest accelerated slow-kill protocol, which means I should test negative within the next 10-12 months (as opposed to 2 years). If you need to know more about this newest protocol, my foster mom will be glad to fill you in! I am kennel and house trained and I don't shed...that makes me a pretty low maintenance kind of girl. I love attention any time I can get it and I will be your best bud, especially if you have a treat! If you would like to meet me please go to www.newbestfriend.org and submit an adoption application. My adoption fee is $250, which includes vaccinations, spay/neuter and microchip. PLEASE NOTE: We do not adopt outside the Greater Houston area. My name is Numi! I was born right before Christmas 2017 along with a bunch of siblings. My mama is a 45 lb. Hound mix and even though our daddy didn't leave a calling card (and no puppy support! ), we think he could have been an Australian Shepherd or mix, best guess. With any litter, there can be multiple dads so mama may have been a party girl :). I am a teenager right now and the smallest of the litter but that doesn't stop me from playing with the big kids! I am black and brown but have some white markings, too. I am very sweet and self assured even though I am the smallest - can push and shove at the food bowl, too! I get the zoomies once in a while (a riot to watch!) but I am a fairly laid back dog for a pup. I am all done with my vaccinations and spay so I am ready to call your house my new forever home! If you would like to meet me please go to www.newbestfriend.org and submit an adoption application. Our adoption fee is $250, which includes vaccinations, spay/neuter and microchip. PLEASE NOTE: We do not adopt outside the Greater Houston area. My name is Noah! I was born right before Christmas 2017 along with a bunch of siblings. My mama is a 45 lb. Hound mix and even though our daddy didn't leave a calling card (and no puppy support! ), we think he could have been an Australian Shepherd or mix, best guess. With any litter, there can be multiple dads so mama may have been a party girl :). I am a teenager right now and have just had another growth spurt! I am white and gray with a tiny bit of brown for special effect :(. I have beautiful gray eyes, the only one in the litter (I'm special!). I am a bit shy at first but warm up as I get to know you. I love to run around when I get the zoomies but I also am fairly laid back, too. 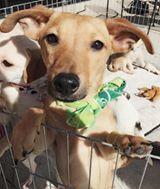 I am all done with my vaccinations and neuter so I am ready to call your house my new forever home! If you would like to meet me please go to www.newbestfriend.org and submit an adoption application. Our adoption fee is $250, which includes vaccinations, spay/neuter and microchip. PLEASE NOTE: We do not adopt outside the Greater Houston area. My name is Niles! I was born right before Christmas 2017 along with a bunch of siblings. My mama is a 45 lb. Hound mix and even though our daddy didn't leave a calling card (and no puppy support! ), we think he could have been an Australian Shepherd or mix, best guess. With any litter, there can be multiple dads so mama may have been a party girl :). I am a teenager right now and the largest of the litter at about 40 lbs but I am more of a goofy gentle giant than anything. I am black and brown but have some white markings, too. I get the zoomies once in a while (a riot to watch!) but I am a fairly laid back dog for a pup. I am all done with my vaccinations and neuter so I am ready to call your house my new forever home! If you would like to meet me please go to www.newbestfriend.org and submit an adoption application. Our adoption fee is $250, which includes vaccinations, spay/neuter and microchip. PLEASE NOTE: We do not adopt outside the Greater Houston area. My name is Nellie! I was born right before Christmas (12/21/17) along with a bunch of siblings. My mama is a 45 lb. Hound mix and even though our daddy didn't leave a calling card (and no puppy support! ), we think he could have been an Australian Shepherd or mix, best guess. With any litter, there can be multiple dads so mama may have been a party girl :). I am a teenager right now and second largest of the litter at 38 lbs. I am a goofy girl but love to be petted. I am black and brown and have some white markings, too. I get the zoomies once in a while (a riot to watch!) but I am a fairly laid back dog for a big pup. I am all done with my vaccinations and spay so I am ready to call your house my new forever home! I If you would like to meet me please go to www.newbestfriend.org and submit an adoption application. Our adoption fee is $250, which includes vaccinations, spay/neuter and microchip. PLEASE NOTE: We do not adopt outside the Greater Houston area. My name is Nefertiti! I was born right before Christmas 2017 along with a bunch of siblings. My mama is a 45 lb. Hound mix and even though our daddy didn't leave a calling card (and no puppy support! ), we think he could have been an Australian Shepherd or mix, best guess. With any litter, there can be multiple dads so mama may have been a party girl :). I am a teenager right now and am a little lanky. 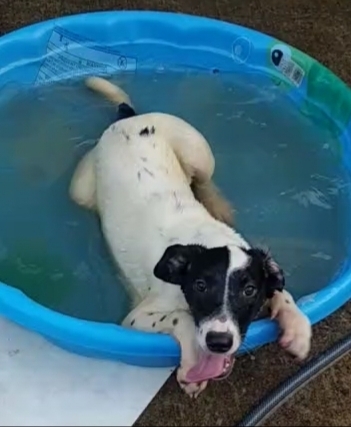 I am an active girl who LOVES playing in the water and can't figure out why the others don't join me! 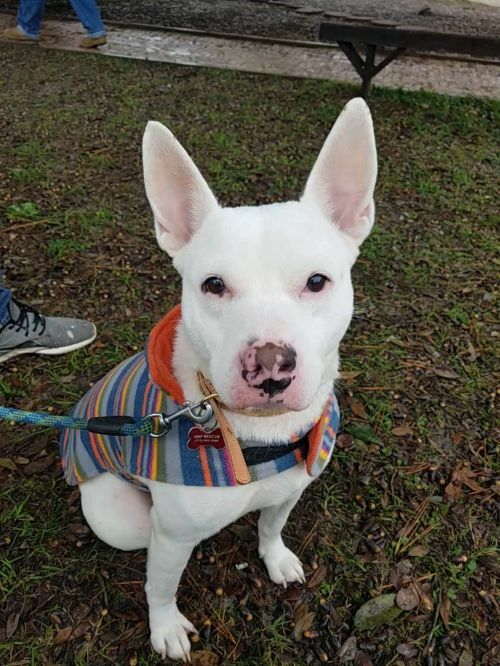 Although I am active and love to run zoomies, I am a fairly laid back dog for a pup. I am all done with my vaccinations and spay so I am ready to call your house my new forever home! If you would like to meet me please go to www.newbestfriend.org and submit an adoption application. Our adoption fee is $250, which includes vaccinations, spay/neuter and microchip. PLEASE NOTE: We do not adopt outside the Greater Houston area. My name is Naomi! I was born right before Christmas 2017 along with a bunch of siblings. My mama is a 45 lb. Hound mix and even though our daddy didn't leave a calling card (and no puppy support! ), we think he could have been an Australian Shepherd or mix, best guess. With any litter, there can be multiple dads so mama may have been a party girl :). I am a teenager right now and one of the smallest of the litter, weighing about 30-ish pounds. I have the most gorgeous markings! I am black and brown and my fur always looks sleek, no matter how much I roll in the dirt! I love to run around in circles when I get the zoomies but I also love to sidle up to you to get a good pet. I am all done with my vaccinations and spay so I am ready to call your house my new forever home! If you would like to meet me please go to www.newbestfriend.org and submit an adoption application. Our adoption fee is $250, which includes vaccinations, spay/neuter and microchip. PLEASE NOTE: We do not adopt outside the Greater Houston area. Hi, my name is Pepper! 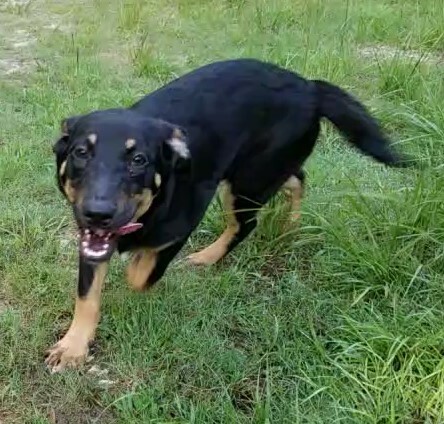 I am a Shepherd mix (by best guess) and I am one year old. I currently weigh about 30 lbs and I am energetic and playful although still learning social skills because I am quite shy. I wrestle with my brothers and love any kind of toy that squeaks or makes a sound. I am rambunctious and vocal and a great wrestler (I have to be, I'm an only girl!). I am learning to potty on a schedule and doing well. I have a really good appetite and there isn't much in the way of food that is put in front of me that I won't devour. And I can sniff out a biscuit in your pocket - Milk Bones are my favorite! If you are interested in meeting me please go to www.newbestfriend.org and submit an adoption application. The adoption fee is $250 and includes neuter, vaccinations and microchip. NOTE: We do not adopt outside the Greater Houston area. Hi, Iâm Roscoe! 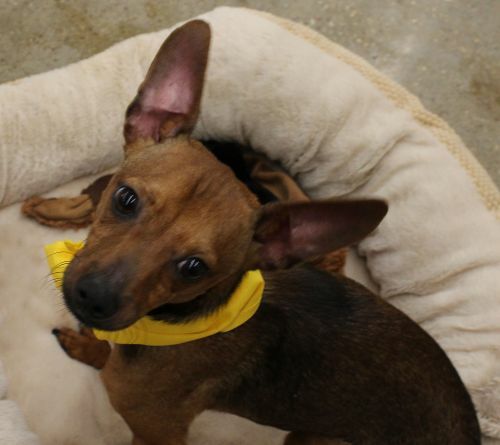 I am two years old and I am a Dachshund mix, possibly ChiWeenie, weighing in at 11 lbs. 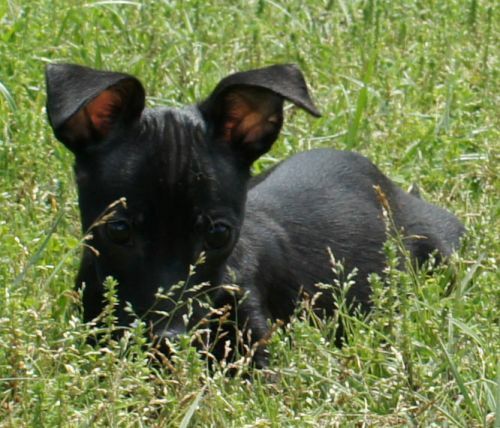 I am energetic and playful and I love to wrestle with my foster siblings but I L.O.V.E. my toys! I get along with everybody and I am a great wrestler, even with dogs larger than me. I am also a little busybody and am a blanket thief! I also like to burrow and cuddle when Iâm ready for a nap but really love something soft to sleep on and that's where your lap or bed comes in :). My best fit in a forever home is with adults and children that are older (12 years plus). I am working on my house training and know the routine of when we all go out together on a schedule. If you are interested in meeting me please go to www.newbestfriend.org and submit an adoption application. The adoption fee is $250 and includes neuter, vaccinations and microchip. NOTE: We do not adopt outside the Greater Houston area. Hi folks, I'm Nala! 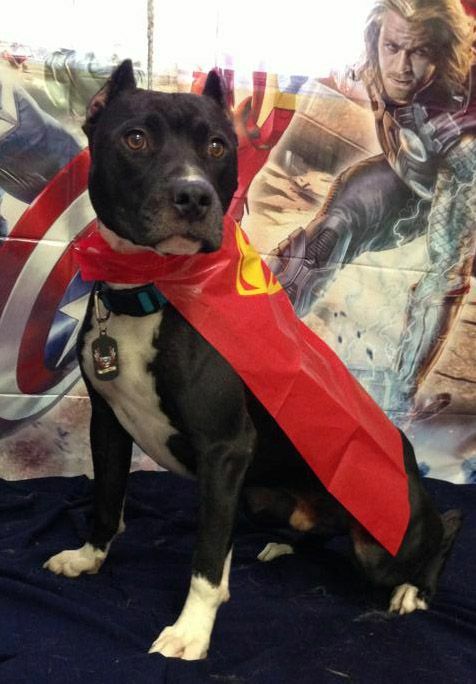 I am a 6 year old Pit Bull Terrier with beautiful brindle markings and a sweet personality to go with it. I love older kids (I know, because that's what kind I live with) and other dogs and cats. I am a lover girl who has had a rough life but ready to find my forever home. I weigh approximately 50 lbs and am house trained. If you would like to meet Nala, please go to www.newbestfriend.org and submit an adoption application. Our adoption fee is $250 and includes vaccinations, spay and microchip. Please note - we do not adopt outside the Houston area. Meet Elias! This little doll is a 4 year old Dachshund mix weighing in at 12 lbs. He is a happy, active boy who is interested in everything going on around him. He loves his squeaky toys and playing with his siblings. Oh, and food. He loves food. And stealing toys. 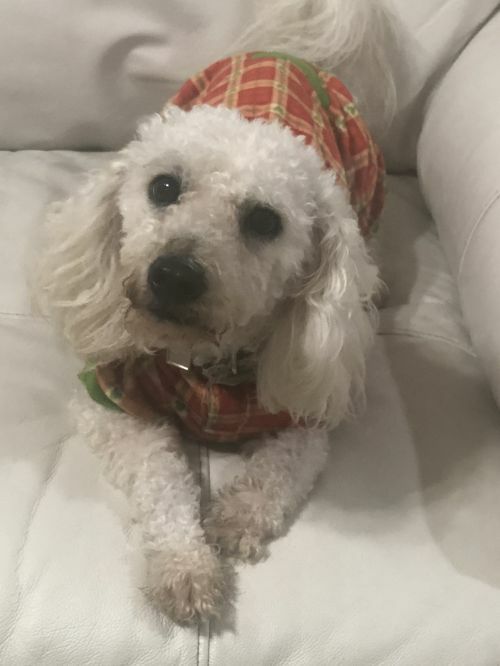 He is very shy so would do best in a home where his pet parents are willing to be patient with him and help him adapt to his new surrounding. When he gets comfortable he will be the best cuddler. Elias is ready to find his forever family...is it you? If you would like to meet him please go to www.newbestfriend.org and fill out an application. Our adoption fee is $250 and includes vaccinations, neuter and microchip. Please Note: We are not able to adopt outside the Houston and close surrounding area. Meet Sara! She is 5 years old and is a friendly, bouncy little girl. She is a bit shy at first but is quite the busy body so isn't about to let anything escape her attention. She loves to stand on her hind legs and dance with her front legs - adorable! She gets along well with other dogs. This little girl is happy all the time and ready to play or explore at a moment's notice. She weighs about 12 lbs. 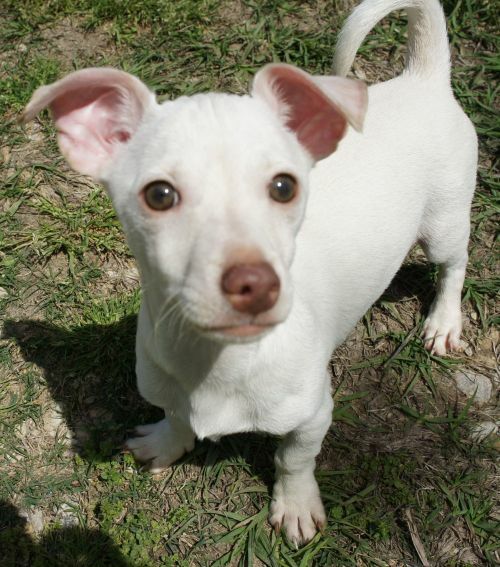 If you would like to meet this adorable pup please go to www.newbestfriend.org and fill out an application. Our adoption fee is $250 and covers spay or neuter, vaccinations and microchip. PLEASE NOTE - we are not able to adopt outside of the Houston and close surrounding area. Meet Gareth! Gareth is 5 years old and is a squatty little boy. 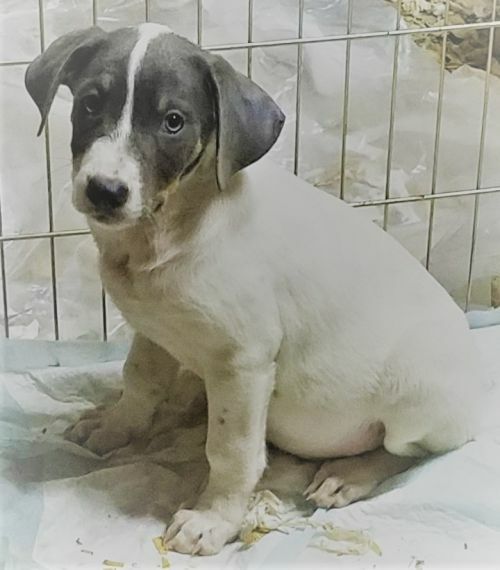 He loves to hop around and play with his foster siblings and his toys but will settle down and cuddle if you pick him up or he climbs on your lap. Mama was a Dachshund mix and Gareth has some of the characteristics but is more hound looking, although he is still a smaller dog and weighs about 17 pounds. If you would like to meet Gareth, please go to www.newbestfriend.org and fill out an application. Our adoption fee is $250 and includes vaccinations, spay/neuter and microchip. PLEASE NOTE - we are not able to adopt outside of the Houston and close surrounding area. Meet Donatello! This little munchkin has the sweetest personality. He loves to play but, being the smallest of the litter, he is also the one who loves the cuddles. 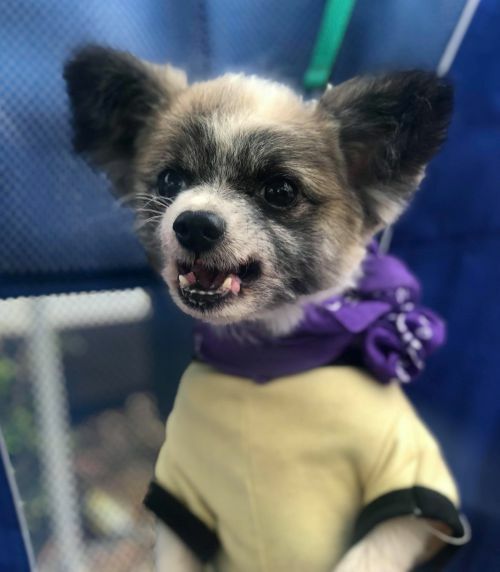 He is a sweet, lively little guy with very soft fur. He is 5 years old and weighs approximately 9 pounds. He loves his treats and playing wrestle with his foster siblings. He can be very shy at first but will warm up with a little time and patience. If you would like to meet this sweet little boy, please go to www.newbestfriend.org and fill out an adoption application. Our adoption fee is $250 and covers neuter, vaccinations and microchip. PLEASE NOTE - we are not able to adopt outside of the Houston and close surrounding area. Meet Michelangelo! He is an active and personable guy. Although very reserved at first, he loves to be petted and cuddled once he knows you a little better. 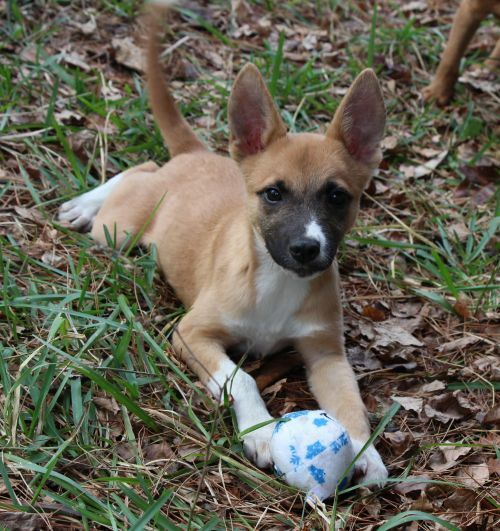 He will need a family who will be patient enough to give him time to adapt to his new surroundings. Michelangelo has a stocky build, sweet demeanor and a playful side, even when he is playing by himself. He is 5 years old and weighs approximately 10 pounds. He loves his treats and just being right next to you. 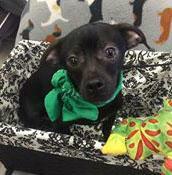 If you would like to meet this cute little guy, please go to www.newbestfriend.org and fill out an adoption application. Our adoption fee is $250 and covers neuter, vaccinations and microchip. PLEASE NOTE - we are not able to adopt outside of the Houston and close surrounding area. Meet Leonardo! He is a sweet, lively little guy with a stocky build and playful demeanor. He is 5 years old and weighs approximately 10 pounds, all muscle. He loves his treats and playing wrestle with his foster siblings and attacking stuffed animals. He can be very reserved so needs some time and patience to adjust to new surroundings. 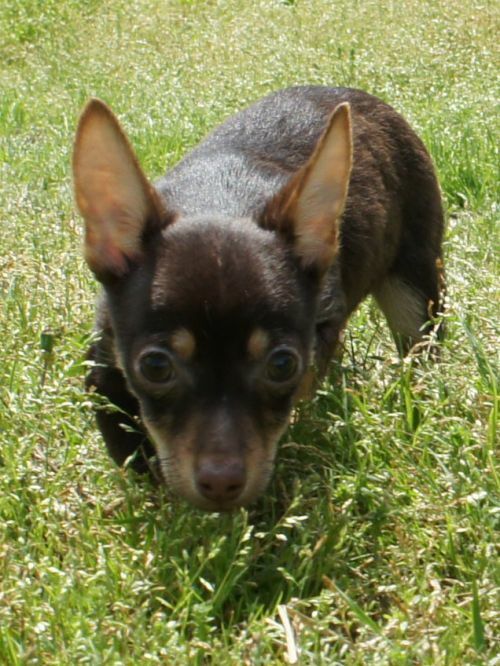 If you would like to meet this little guy, please go to www.newbestfriend.org and fill out an adoption application. Our adoption fee is $250 and covers neuter, vaccinations and microchip. PLEASE NOTE - we are not able to adopt outside of the Houston and close surrounding area. Pittie is 7 years old and his favorite thing in life is riding in the car with his head and shoulders out the window. He is not a big barker and a pretty quiet dog overall. He prefers the company of smaller dogs to dogs his size and needs regular exercise - he loves his walks, especially because he loves to hang out with you. He knows to sit and wait for his food and is best suited for families with older children. If you would like to meet Pittie, please go to www.newbestfriend.org and fill out an application. Our adoption fee is $250 and includes neuter, vaccinations, and microchip. PLEASE NOTE - we are not able to adopt outside of the Houston and close surrounding area.